The War of the League of the Indies (December 1570 – 1575) was a military conflict in which a pan-Asian alliance formed primarily by the Sultanate of Bijapur, the Sultanate of Ahmadnagar, the Kingdom of Calicut and the Sultanate of Aceh, referred to by the Portuguese historian António Pinto Pereira as the "league of kings of India",  "the confederated kings" or simply "the league", attempted to decisively overturn Portuguese presence in the Indian Ocean through a combined assault on some of the main possessions of the Portuguese State of India: Malacca, Chaul, Chale fort, and the capital of the maritime empire in Asia, Goa. Samoothiri of Kozhikode is the hereditary title of the Hindu monarch of the kingdom of Kozhikode on Malabar Coast, India. The Samoothiris were based at the city of Kozhikode, one of the important trading ports on the south-western coast of India. At the peak of their reign, the Samoothiri's ruled over a region from Kollam (Quilon) to Panthalayini Kollam (Koyilandy). In 1565, the Deccan sultanates joined forces to strike a decisive blow against the Vijayanagara Empire at the Battle of Talikota. The Hindu Vijayanagara Empire had been engaged in an incessant, irregular war against each of the Muslim sultanates of the Deccan Plateau individually, well before the Portuguese arrived in the Indian Ocean. The rulers of Vijayanagara, (whom the Portuguese referred to as simply the Rei Grande - "Great King") and especially Rama Raya, were powerful partners of the Portuguese, but with the Empire now thrown into chaos and plundered, the Adil Shah of Bijapur once more sought to recover the city of Goa, which had been lost over half a century ago to the Portuguese, and altogether expel them from the western coast of India. The Deccan Sultanates were five Muslim dynasties that ruled several late medieval Indian kingdoms, namely Bijapur, Golkonda, Ahmadnagar, Bidar, and Berar in south-western India. The Deccan sultanates were located on the Deccan Plateau, between the Krishna River and the Vindhya Range. These kingdoms became independent during the break-up of the Bahmani Sultanate. They were noted for the destruction of temples and general economic misery. In 1490, Ahmadnagar declared independence, followed by Bijapur and Berar in the same year. Golkonda became independent in 1518 and Bidar in 1528. The Battle of Talikota was a watershed battle fought between the Vijayanagara Empire and the Deccan sultanates. The battle took place at Talikota, today a town in northern Karnataka, about 80 kilometres (50 mi) to the southeast from the city of Bijapur. The defeat of Vijayanagara Empire, followed subsequent destruction and looting which became short lived before the successors of Rama Raya. Realizing that Portuguese naval power was key to their resilience, allowing them to reinforce any of their strongholds by sea, the Adil Shah attempted to deny this advantage by convincing as many rulers to attack the Portuguese simultaneously, particularly the Sultan of Ahmadnagar, and the Zamorin of Calicut, who commanded considerable naval forces. Religious anymosity between the Portuguese and several Muslim dynasties of Asia would provide an easy point of accord towards this endeavour. Thus, envoys were dispatched to the Sultanate of Aceh in Sumatra, the Ottoman Empire, the Kingdom of Sitawaka in Ceylon, the Sultanate of Gujarat, the Sultanate of Johor among others urging them to join the alliance and defeat the Portuguese once and for all. The Yemen Eyalet was an eyalet (province) of the Ottoman Empire. In 1872, most of it became Yemen Vilayet after a land reform in the empire. 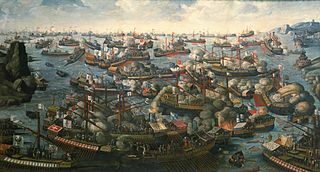 The Battle of Lepanto was a naval engagement that took place on 7 October 1571 when a fleet of the Holy League, led by the Venetian Republic and the Spanish Empire, inflicted a major defeat on the fleet of the Ottoman Empire in the Gulf of Patras. The Ottoman forces were sailing westward from their naval station in Lepanto when they met the fleet of the Holy League which was sailing east from Messina, Sicily. The Holy League was a coalition of European Catholic maritime states which was arranged by Pope Pius V and led by John of Austria. The league was largely financed by Philip II of Spain, and the Venetian Republic was the main contributor of ships. Conquered by Afonso de Albuquerque in 1510, Goa stood on an island surrounded by crocodile infested rivers that could, however, be waded across in some areas during the dry season. The closest and most important fording point to the city of Goa was the Passo Seco ("Dry Pass"), defended by the fortress of Benastarim. Dom Luís de Ataíde decided to distribute his forces in 19 critical points along the eastern river banks, where artillery batteries were established, garrisoned with 20 to 80 men and a contingent of lascarins, to keep the colossal army of Bijapur from crossing. Every battery was to have visual contact with the next and their garrisons were not to leave their posts unless ordered to. The deeper waters of the Mandovi and Zuari rivers, to the north and south respectively, were patrolled by four galleys, a half-galley and twenty small galleys called foists. On the opposite shore northwest of Goa, the Portuguese fortress of Reis Magos was supported by an anchored galleon. In early March, Dom Luís de Melo returned from Malacca, having successfully defended that city from an Acehnese attack, and brought reinforcements from Cochin, totalizing 1500 men. In the 13th, the Adil Shah ordered a decisive assault across the river, under the command of a Turk, Suleimão Agá. 9,000 men waded across the river either by foot or on small crafts and many reached the opposite banks, but came under heavy fire from Portuguese ships, artillery batteries and arquebuses, until they were finally shattered by a Portuguese counter-attack of 300 men under the command of Luís de Melo and Dom Fernando de Monroy, who landed on the opposite shore, killing about 3,000 enemies. By the late afternoon, a strong storm spelled the end of the assault. As the weather worsened with the coming of the monsoon rains, the Adil Shah kept his army camped in front of Goa, while torrential storms forced operations down to a minimum and the Portuguese conducted occasional raids under the rain. By August the 15th,  with his army profoundly demoralised, afflicted by the monsoon weather and suffering from shortage of supplies, the Adil Shah ordered the steady withdrawal of his forces, having lost over 8,000 men, 4,000 horses, 300 elephants and over 6,000 oxen in the campaign. He abandoned 150 pieces of artillery in the river. By December 13, 1571, the Shah formally requested peace with the Portuguese. Portuguese fort of Mangalore. The town was protected by a stockade and entrenchments. 19th century British map of Chaul. The forces of Ahmadnagar were unable to prevent the Portuguese from reinforcing the city by sea. The Nizam assembled the rest of his forces around the north and northeast the city. On the 21st day of December he breached the fortified perimeter around the monastery of São Francisco on the outskirts of Chaul, but the heavy fire of the Portuguese arquebuses and a swift counter-attack forced them to retreat. In the meantime, the Nizam set his powerful artillery to the east of the city under the supervision of a Turkish general, Rumi Khan, near a village the Portuguese dubbed Chaul de Cima (Upper Chaul). At the same time, about 2,000 horsemen of the Nizam proceeded to devastate the lands owned by Portuguese around Bassein and Daman, but were repelled trying to assault a small Portuguese fort at Caranjá near Bombay, defended by 40 Portuguese soldiers. Fighting around Chaul broke down to trench warfare, as the army of Ahmadnagar dug trenches towards Portuguese lines to cover from their gunfire, amidst frequent Portuguese raids. The Portuguese dug counter-mines to neutralize them. At Goa, Dom Jorge was arrested, and taken to a military trial, which concluded that given the circumstances he had enough means to resist a prolonged siege, and was formally executed. Although every attempt to conquer Malacca's had so far failed, the Acehnese still maintained hopes that the Portuguese might be caught debilitated after fighting two consecutive sieges. Indeed, the previous attacks had left the Portuguese garrison decimated, crops destroyed and foodstuffs and gunpowder in the city nearly exhausted. The fort of Chale had little strategic interest, and its loss did not represent a serious setback for the Portuguese. The fall of Vijayanagara however, had indirectly greater strategic implications for the Portuguese State of India, whose finances suffered a severe blow with the loss of the extremely lucrative horse trade with the Empire. It would take the assistance of other European powers to challenge the hegemony of the Portuguese, who would suffer their first serious setback with the fall of Hormuz, at the hands of combined Anglo-Persian force, about forty years later in 1622. Dom Luís de Ataíde was succeeded in office by Dom António de Noronha in September 1571. On his arrival in Portugal in July 1572, Ataíde was solemnly received by King Sebastian, and awarded several honours including the command of the planned expedition to Morocco - which he turned down, for disagreeing with the nature of the undertaking. In 1578, he was reappointed Viceroy of India, and would in fact be the last Viceroy nominated by the Portuguese Crown before the Iberian Union. He died in office in 1581. In the Moluccas, the great distances made it extremely difficult, if not completely impossible, for the Portuguese Crown to direct a consistent policy in such a remote region, meaning it was often reduced to the initiative of individual captains assigned to the archipelago. In late 1570, the captain of Ternate Diogo Lopes de Mesquita had Sultan Khairun of Ternate assassinated, as the latter had been persecuting native Christians for some time. This proved untimely, as it provoked a major rebellion led by the late Sultan's son Baabullah (Babu in Portuguese), who allied with the Sultan of Tidore with support of the Javanese against the Portuguese. Although seemingly unrelated with the "league", the larger conflict in mainland Asia left the Portuguese incapable of sending sufficient reinforcements to the Moluccas in each sailing season, between the monsoons. In a prolongued conflict that extended to Portuguese positions in Gilolo, Ambon and Banda, the critically isolated Portuguese could count on little aid to defend not just themselves, but also the nascent communities of local Christians. In March 1576, the Portuguese began construction of a new fortress on Ambon, that henceforth became the center of Portuguese activity in the Moluccas. In 1578, as per request of its Sultan, the Portuguese built a new fort on Tidore, to where those still in Ternate relocated. The Battle of Diu was a naval battle fought on 3 February 1509 in the Arabian Sea, in the port of Diu, India, between the Portuguese Empire and a joint fleet of the Sultan of Gujarat, the Mamlûk Burji Sultanate of Egypt, the Zamorin of Calicut with support of the Republic of Venice. The Sultanate of Aceh, officially the Kingdom of Aceh Darussalam, was a Sultanate centered in the modern-day Indonesian province of Aceh. It was a major regional power in the 16th and 17th centuries, before experiencing a long period of decline. Its capital was Kutaraja, the present-day Banda Aceh. Sultan Alauddin Riayat Shah II ibni Almarhum Sultan Mahmud Shah was the first Sultan of Johor. He ruled Johor from 1528 to 1564. He founded the Johor Sultanate following the fall of Malacca to the Portuguese in 1511. He was the second son of Mahmud Shah of Malacca. Thus, Johor was a successor state of Malacca and Johor's sultans follow the numbering system of Malacca. Throughout his reign, he faced constant threats from the Portuguese as well as the emerging Aceh Sultanate. Timoji was a privateer who served the Vijayanagara Empire and the Portuguese Empire during the first decade of the 16th century. He claimed to have been born in Goa and to have escaped the city after its conquest by the Adil Shahi of Bijapur in 1496. After his support in the 1510 Portuguese conquest of Goa, he was for a short time appointed aguazil of the city. Sultan Alauddin Ri'ayat Syah al-Kahar was the third sultan of Aceh, and was one of the strongest warrior rulers in the history of the kingdom. In his time the power structures that his father had begun were greatly strengthened. His age was marked by warfare with the Portuguese and Malay rivals, with varying fortunes. The Ottoman–Portuguese Conflicts (1580–1589) were armed military conflicts between the Portuguese Empire and the Ottoman Empire and in the Indian Ocean, specifically in the east-African coast. Rasul Khan was one of the finest generals of Ismael Adil Shah, the Sultan of Bijapur. The Ottoman expedition to Aceh started from around 1565 when the Ottoman Empire endeavoured to support the Aceh Sultanate in its fight against the Portuguese Empire in Malacca. The expedition followed an envoy sent by the Acehnese Sultan Alauddin Riayat Syah al-Kahhar (1539–71) to Suleiman the Magnificent in 1564, and possibly as early as 1562, requesting Ottoman support against the Portuguese. The Siege of Diu occurred when an army of the Sultanate of Gujarat under Khadjar Safar, aided by forces of the Ottoman Empire attempted to capture the city of Diu in 1538, then held by the Portuguese. 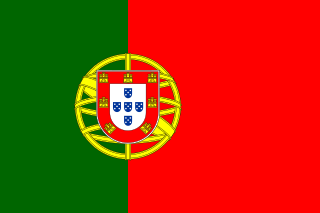 The Portuguese successfully resisted the four months long siege. It is part of The Ottoman-Portuguese War. Rachol, also known as Raitura is a village in Salcete, Goa, in south-western India. It is located on the left bank of the Zuari River and is home to the famous Rachol Seminary. The famous Portuguese colonial fort of Rachol has been completely erased, leaving behind the traces of the moat and the main gate. The village has many heritage structures and is an important site to study the history of Salcete. The Church of Our Lady of Snows at Rachol is said to be the first church of Salcete and is called the Matriz of South Goa. Ilha de Rachol is a part of the village. The Capture of Malacca in 1511 occurred when the governor of Portuguese India Afonso de Albuquerque conquered the city of Malacca in 1511. The Portuguese conquest of Goa occurred when the governor of Portuguese India Afonso de Albuquerque captured the city in 1510. Goa was not among the cities Albuquerque had received orders to conquer: he had only been ordered by the Portuguese king to capture Hormuz, Aden and Malacca. A Siege of Malacca occurred in 1568, when the Sultan of Aceh Alauddin attacked the Portuguese-held city of Malacca. The city had been held by the Portuguese since its conquest by Afonso de Albuquerque in 1511. The Battle of River Duyon was a naval engagement between the Portuguese forces commanded by Nuno Álvares Botelho, who is renowned in Portugal as the last great commander of Portuguese India, and the forces of the Sultanate of Aceh, which were led by General Lassemane. The Battle of the Gulf of Oman was a naval battle between a large Portuguese armada under Dom Fernando de Meneses and the Ottoman Indian fleet under Seydi Ali Reis. The campaign was a catastrophic failure for the Ottomans who lost all of their ships. 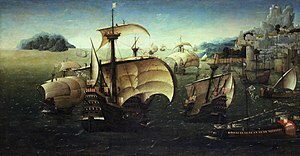 The Naval Battle of Aceh was fought in 1569 off the coast of Sumatra between a lone Portuguese carrack and an armada of the Sultanate of Aceh, that was about to stage an attack on Portuguese Malacca. It ended in Portuguese victory and the withdrawal of the Aceh fleet after suffering heavy losses. 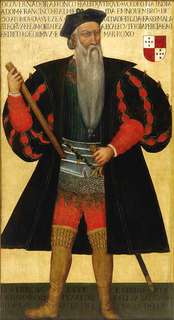 Garcia de Sá was a Portuguese nobleman, soldier, explorer, fidalgo of the Royal Household, who was the 14th ruler of Portuguese India as governor from June 1548 to 13 of June 1549. The Siege of Johor of 1587 was a military operation in which Portuguese forces successfully sieged, sacked and razed Johor, capital of its eponymous Sultanate. The city would later be rebuilt in a different location. The Battle of the Strait of Hormuz was fought in August 1553 between an Ottoman fleet, commanded by admiral Murat Reis, against a Portuguese fleet of Dom Diogo de Noronha. The Turks were forced to retreat after clashing with the Portuguese. António Pinto Pereira (1617), História da Índia, ao Tempo Que a Governou o Vice-Rei D. Luiz de Ataíde, 1986 edition, Imprensa Nacional Casa da Moeda, Lisbon. Diogo do Couto (1673), Da Ásia, Década Oitava, 1786 edition, Biblioteca Nacional de Portugal. Diogo do Couto (1673), Da Ásia, Década Nona, 1786 edition, Biblioteca Nacional de Portugal. 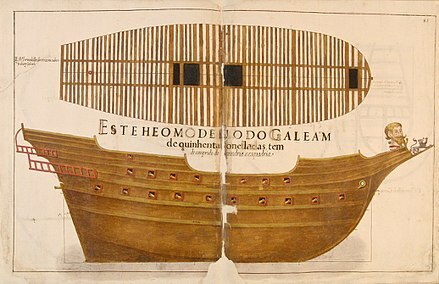 Jorge de Lemos (1585) História dos Cercos de Malaca, edition, Biblioteca Nacional, Lisboa. Saturnino Monteiro (2011), Portuguese Sea Battles, Volume III - From Brazil to Japan, 1539-1579. Gonçalo Feio (2013), O ensino e a aprendizagem militares em Portugal e no Império, de D. João III a D. Sebastião: a arte portuguesa da guerra. University of Lisbon. M. Zinadim Ben-Ali Ben-Ahmed (1583), translation by David Lopes (1898), in História dos Portugueses no Malabar, (Portuguese Edition) 2010 edition, Kessinger Publishing. R.O.W Goertz: Attack and Defense Techinques in the Siege of Chaul 1570-1571 in Luís de Albuquerque, Inácio Guerreiro: Actas do II Seminário Internacional de História Indo-Portuguesa, Instituto de Investigação Científica Tropical, Centro de Estudos de História e Cartografia Antiga, Lisbon, 1985. ↑ Nuno Vila-Santa, in Temas e Factos: Talikota, Batalha de. Faculdade de Ciências Sociais e Humanas, Nova University of Lisbon. ↑ Pereira 1617, p. 349. ↑ In Pereira (1617), 1986 edition, pg. 356. ↑ In Portuguese: [...]Determinara ordenar-lhe a passagem per terra, mãdando trabalhar (em hum entulho que determinara fazer no rio até a ilha de Ioam Lopes, donde a entrada lhe ficaria muito fácil) grãdissima soma de gastadores & officiais. E por muitos que se lhe matavã, nunca desitia do entulho: porque desta sorte de gente fazem os mouros tã pouca estima que quasi a não ham por perda, & por muita que percão della nunca lhe falece in Pereira, 1616, pg 411. ↑ Além disso alguns dos seus ministros estavam conluiados com os frangues para o prenderem, e porem no trono um parente próximo, que estava em Goa com os frangues; Adilxá informado desta trama teve medo e fugiu das tropas; e quando esteve em lugar seguro mandou prender os conspiradores e meteu-os na prisão, inflingindo-lhes grandes penas e retirando-lhes as suas mercês. Nestas circunstâncias foi forçoso a Adilxá fazer a paz. in ZINADIM, História dos Portugueses no Malabar, Portuguese translation by David Lopes, 1898, 2010 edition, Kessinger Publishing. ↑ Pereira 1617, p. 624. ↑ Pereira 1617, p. 625. ↑ Pereira 1617, p. 623. ↑ Pereira 1616, p. 461. ↑ Pereira 1617, p. 464. ↑ Pereira 1617, p. 574. ↑ Pereira 1617, p. 361-353. 1 2 Pereira 1617, p. 368. ↑ R.O.W Goertz: Attack and Defense Techinques in the Siege of Chaul 1570-1571 in Luís de Albuquerque, Inácio Guerreiro: Actas do II Seminário Internacional de História Indo-Portuguesa, Instituto de Investigação Científica Tropical, Centro de Estudos de História e Cartografia Antiga, Lisbon, 1985. ↑ Pereira 1617, p. 381. ↑ (a cannonball from the largest cannon of the Nizam bounced off a fortified blockhouse, demolishing it, and then hit the galley). ↑ 16th century depiction, by Gaspar Correia. Erected in 1531, about 10km from Calicut. By 1570, part of the garrison lived among the populace, as casados. ↑ Pereira 1617, p. 616-618. ↑ Monteiro 2011, p. 339. ↑ Monteiro 2011, p. 371. ↑ Crowley, Roger (2015). Conquerors: How Portugal Forged the First Global Empire, pg. 362. "Even a massive pan-Indian assault on Goa and Chaul in the years of 1570-1 died at the walls. The Franks could not be dislodged"